Here is one simple productivity hack most people overlook. Do this, and you’ll find that you have more mental capacity to deal with anything that stands in your way. Do you feel that running your business demands your all? 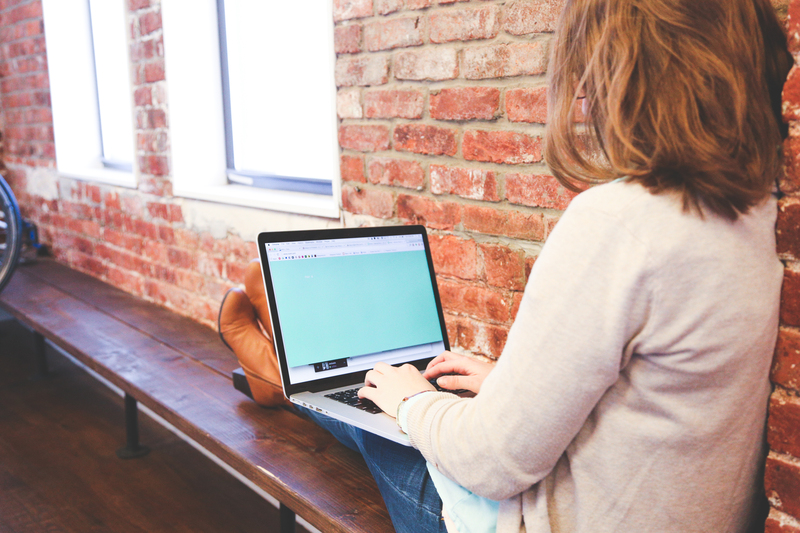 Find out why defeating this monster is a high priority if you want to be self-employed over the long haul. Showing up for yourself, for your business, and for your family are key ingredients to being a fulfilled entrepreneur. Today’s video contains one question you need to ask to guarantee your happiness. The End of the Jeff Walker & Brendon Burchard Era? Recently, I received what is quite possibly the most shocking email I’ve received in a long time. It was from Jeff Walker and he was promising another bonus from a book he launched over a year ago. Being a huge fan of Jeff Walker, I clicked on the link to find out what new bonus I was about to receive. In Jeff Walker style I was taken to a landing page which included one of his sales videos explaining that he was offering a bonus he had never done before and that this bonus was only available to people who had purchased his best-selling book, Launch. He was offering tickets to his large event session, PLF Live. Now, what makes this so remarkable is that these tickets were usually only available to people who have purchased his Product Launch Formula program at nearly $2000. This follows the same formula Brendon Burchard uses for his Experts Academy and Total Product Blueprint. Buy a high-ticket item program, and get a low-cost live event, usually for registration fee of around a hundred dollars. Is it really getting that hard for Jeff Walker to fill a room, that he would open up registration to people who bought his book? It really feels like he’s struggling to fill the room. Now here’s the kicker: he’s not alone! Earlier this year Brendon Burchard did something I’ve never seen him do before. He offered an alumni discount to one of his other programs. 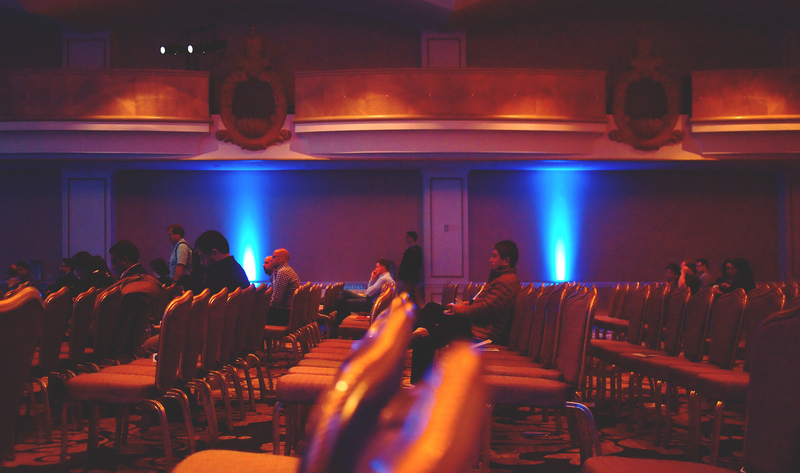 Usually the people who buy the Experts Academy program get to go to a large event, Experts Academy Live. On top of that, Brendan also has a different program which has to do with performance. This program also has its own live event at its own ticket price. You buy the program for around $1000, and you get a discount ticket to go to the live event. In the past it didn’t matter if you had already purchased a ticket to Experts Academy — if you wanted to go to the High Performance Academy, you had to pay the full price — the market rate. This year was the first time I’ve ever seen Brendon Burchard offer an alumni ticket price. So, for those of you who were members of his Experts Academy or Total Product Blueprint courses, you could get an alumni tickets for only $297 to go to the High Performance Academy event. Run the math on that for a minute – $997 last year but only $297 this year. That’s a $700 savings, folks! All of this begs the question: why in the world would Brendon Burchard discount prices so heavily? He is supposed to be the king of high-end tickets. The king of high-end programs. Why all the sudden is the pressure here moving across the largest names in the industry so much so that they would discount tickets? My guess is that this industry is counter-cyclical, meaning that several years ago when the economy was in the dumps there were thousands of people out looking to start their own business and there were thousands of people out there who wanted to be an instant expert or author and make millions of dollars. Nowadays with the economy doing so well, there are more people who’ve taken jobs with employers. There are less and less people who are wanting to strike out their own route. Even if your tickets were being sold before, if you have built a reputation on “selling out every event” you have to start to get pretty creative in an economy this robust. This means to discount the daylights out of these tickets, give them away, just get butts in seats. Starting a new business or launching a new product can really wear you down. In this video you’ll learn why it’s important to take a break. This one is a short one, so click the image above to check it out. I am a huge fan of Michael Hyatt, his GetNoticed! theme, and Platform University. 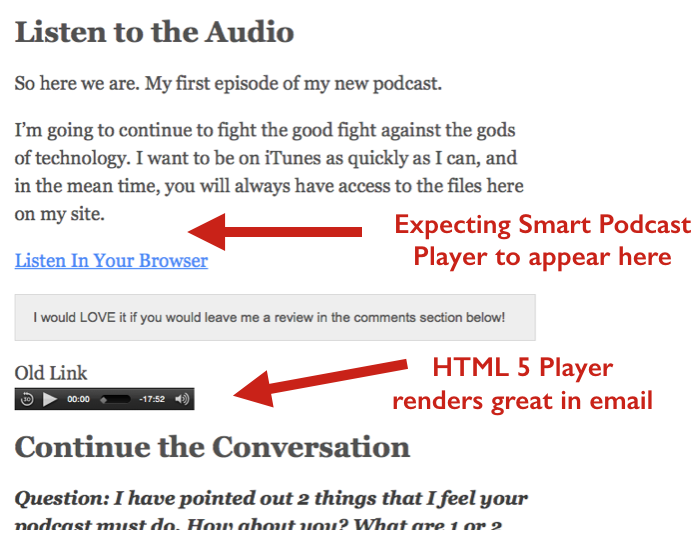 I really like how he is using the Smart Podcast Player, but I couldn’t figure out how to make it work when using RSS with MailChimp. I really enjoy watching how Michael and his team accomplish what seems to be the impossible each week. Recently I have considered reviving my podcast, so I turned my attention to how Michael does it. 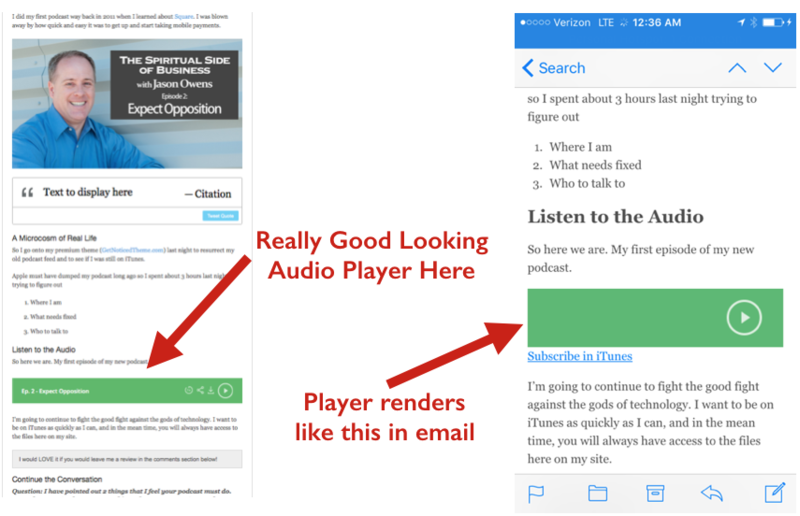 In particular I want to be able to use RSS to feed my blog posts and my podcasts to my reading list. I really like the look of the audio player that Michael uses. I don’t get around much so I had never seen this player before, and I just assumed that this was one of the custom coded things that Michael does for his site. 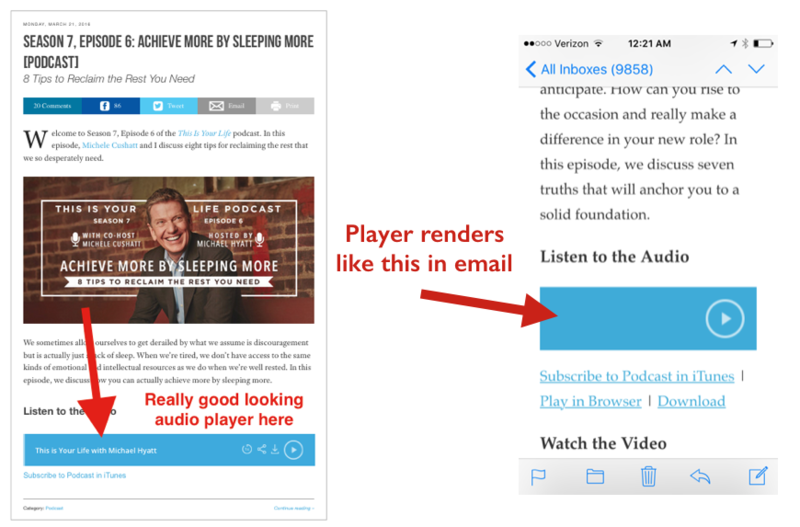 Turns out the player is the Smart Podcast Player available (for a small fee) by Pat Flynn. I subscribed to this WordPress plugin to test out the player on my site. I was very surprised to learn that the player does NOT survive the transition through RSS to my MailChimp emails! After installing the plugin and putting the player in a test post on my bl0g, I sent the post to MailChimp. No Smart Podcast Player appeared in the ensuing email. Not even a hint that a player ever existed in the original post. At first I found this really hard to believe. I thought for certain that the plugin was some HTML5 player that does well in email. I had tested HTML5 players before, and I did not experience this problem. They survived the same RSS-to-MailChimp test with ease as evidenced in the following screen capture. I took a second look at Michael’s email that I was using as a baseline. Turns out the “player” that shows in this email is not a player at all. It is just an image with a built-in link. This was confirmed after hearing back from the tech support person (Ray) at the Smart Podcast Player Support Team. 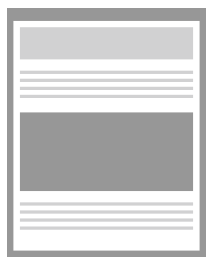 Why do emails sent through MailChimp via RSS from the website show an image that does not exist in the blog post? I can’t tell you exactly how long I beat my brains out over this. I’m not a coder, but I eventually figured out how to do it. At least this method works for me. It turns out that you need to use something called a “fallback” image. Again, I’m not a coder, so I had never heard of this. A fallback is your plan B in the event that something doesn’t load properly. In this case, if the player doesn’t load properly, then resort to plan B — our image that looks like the player. I had to comb through the plugin code to learn how to call the plugin without using the shortcode. This is important because I could not figure out how to make the fallback image work while using the shortcode. In the code snippet below you will notice that I do, however, start with the shortcode. Notice how the url field is empty and no other parameters are listed. This is a critical step, so do not leave out this initial shortcode. I could not get the rest of this to work otherwise. <object class="smart-track-player" width="300" height="150" data-url="http://traffic.libsyn.com/Your_Podcast_Name/Your_Podcast_Episode.mp3" data-download="true"
I found all of the parameters I needed by going through this core.php file. Do a search on “<div” (yes, leave out the last “>”) and this should take you to about the middle of the file where the parameters live. I created the image by creating an instance of the player and then simply taking a screen capture (on Macs, use command+shift+4). You might be wondering how to get the player to look like the one that Michael uses. Notice how his player has only the arrow and the circle. The download icon, the speed icon, and the share icon are all missing. If you want to create a version of this all you need to do is use the code above but strip out the parameters defining social and downloads, etc. Try pasting this code to your site. Just preview the post and then take a screen capture of the image. Trim out the left half of the bar with a photo/image editor. 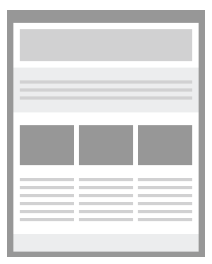 Otherwise, you will get a long thin bar (above) instead of a shorter one (below) which looks better on mobile. Upload this to your WordPress media library and then put the image url in the first code snippet I provided. Now I have a podcast post that functions much the way Michael’s does in that I can pass the “player” in an email that is generated through RSS! This short video will help you grow more than any single activity you do this year. This quick exercise that you can do in less than a minute will lay the foundation to more success than you think possible. 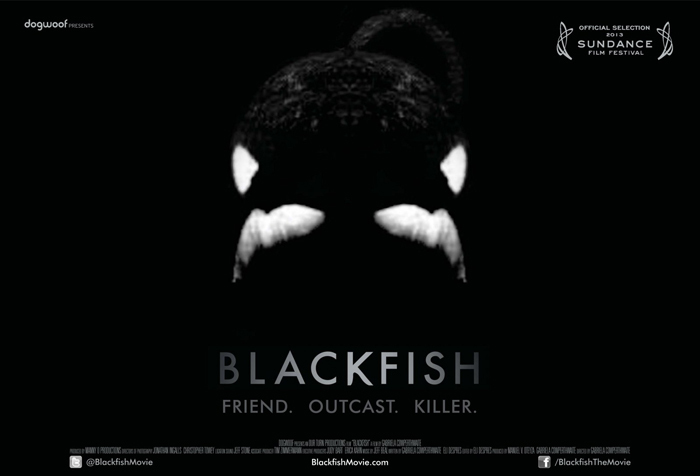 I knew the documentary Blackfish was a powerful story when I first wrote about it two years ago. What happened yesterday is yet one more reminder that people with a message can change the world. I believe this world-changing ability is available to each and every one of us! Blackfish director, Gabriela Cowperthwaite, not only created an award winning documentary on the treatment of orcas at SeaWorld. It turns out she added fire to a movement. While SeaWorld had been under pressure from environmentalists in the past, Blackfish was the spark that ignited the powder keg. Blackfish caused a public backlash against SeaWorld (causing the company’s stock price to suffer), and the movie even inspired action by PETA. Due to the relentless public pressure and mounting financial losses, the company had to take decisive action. Yesterday SeaWorld announced the company is ending its orca breeding program which has drawn great criticism after the film. SeaWorld has been listening and we’re changing…Society is changing and we’re changing with it. SeaWorld is finding new ways to continue to deliver on our purpose to inspire all our guests to take action to protect wild animals and wild places. Cowperthwaite praised the announcement and added that she will continue to lobby for changes in the aquatic theme park industry. Imagine the impact that your life can have. Your efforts are going to lead somewhere. Your work is going to change lives. In fact, your work is probably changing lives already! When you find the activities that grow your business, you can become an unstoppable force when you do those activities consistently. Click now to discover how.